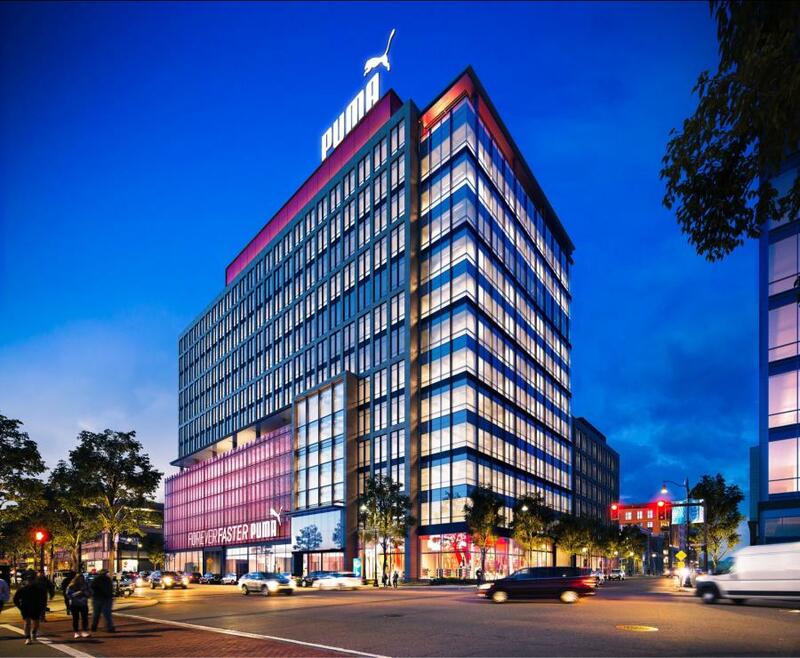 As part of its growth, retention and recruitment strategy, sports company PUMA North America Inc. announced plans to establish a new North American headquarters in Somerville, Mass., in 2021. The new headquarters will bring together two PUMA offices, currently based in Boston and Westford. "We're excited to bring together our talented North American employees in Somerville, a diverse, vibrant city that reflects our values and culture, and will allow us to retain and recruit the best talent across our front and back-end operations," said Bob Philion, president and CEO of PUMA North America. "This new headquarters will allow us to better collaborate, foster diversity of thought, creativity and innovation, and have fun while doing it." The new headquarters, located at 455 Grand Union Blvd., in Somerville, provides the company with five floors of office space totaling 150,000 sq. ft. PUMA intends to have approximately 550 positions at the location once the move is complete, representing a more than 20 percent growth of its workforce. There also will be a 19,000-sq.-ft. roof deck, complete with a recreational area and basketball court. The facility provides employees access to a state-of-the-art fitness center, an on-location kids room, ample bike storage and a 2,300-sq.-ft. balcony. The new space is steps away from the MBTA Orange Line Assembly Square stop and provides employees easy access to Assembly Row's abundant dining, shopping and health and wellness benefits. PUMA has operated a retail location at Assembly Row since 2014. "Our brand mantra, ‘Forever Faster,' spans everything we do — from making to marketing and every discipline in between," said Adam Petrick, global director of brand and marketing at PUMA. "We need to be faster than ever in the way we react and adapt. Somerville is a city buzzing with creative, diverse energy that will help us live out our ‘Forever Faster' mentality." A long-term lease for the space — a soon-to-be-built 300,000-sq.-ft. building — has been negotiated with developer and landlord Federal Realty Investment Trust. PUMA North America was represented by Michael Joyce at Cushman & Wakefield. Federal Realty was represented by Joe Flaherty at JLL. Assembly Row is easily accessible via Interstate 93 and the MBTA, providing ease of access for the company's urban and suburban employees. "We are excited and proud to welcome one of the world's most recognizable brands to Somerville and look forward to introducing PUMA to our talented and diverse workforce," said Somerville Mayor Joseph A. Curtatone. "An energetic, creative and forward-looking company like PUMA will fit right in with the innovation culture that is thriving here and continuing to grow." For more information, visit puma.com.